Glenfarclas Scotch Whisky Distillery was built in 1836 by Robert Hay and is still active in the present day producing Glenfarclas 10 Year Old Single Malt, Glenfarclas 12 Year Old Single Malt, Glenfarclas 15 Year Old Single Malt, Glenfarclas 21 Year Old Single Malt and the Glenfarclas 25 Year Old Single Malt. The contact details for the distillery are Glenfarclas Distillery, Ballindalloch, Banffshire, AB37 9BD and the telephone number being +44 (0)1807 500245. 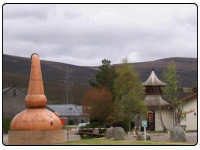 The Glenfarclas Distillery has a visitor centre and the contact telephone number is +44 (0)1807 500257.